The beautiful green trees offer corridors of shade during summer, and the winters are mild in the Highveld. Any time. Trees offer corridors of shade during summer, and winters are mild in the Highveld. There are lovely sunrises in the early morning and sunsets in the afternoon. A tip: it’s less busy during the week. 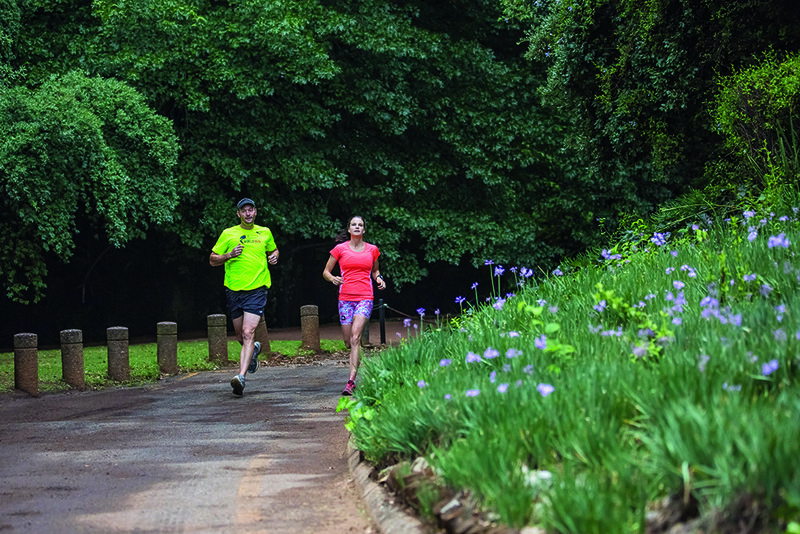 Short runs of 5km to 8km in the Johannesburg Botanical Gardens will take ±30 minutes and ±50 minutes. 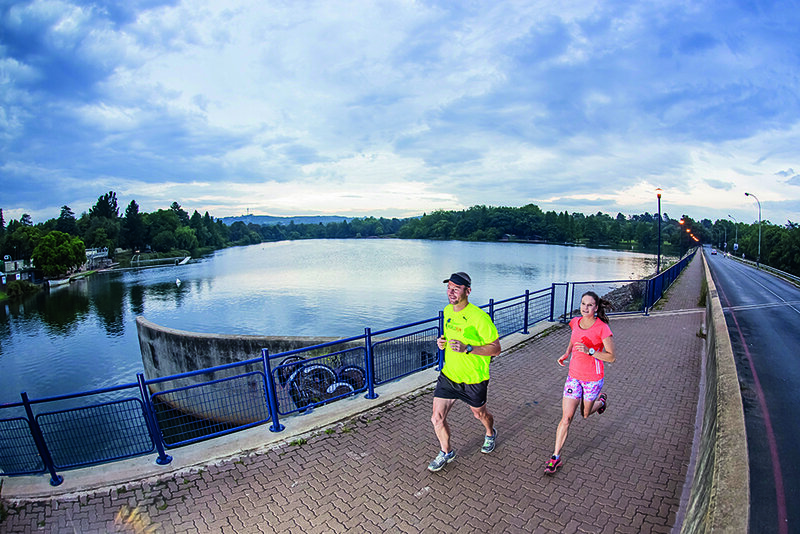 Allow 15 to 20 minutes for the out-and-back 3km trail that heads towards Delta Park. 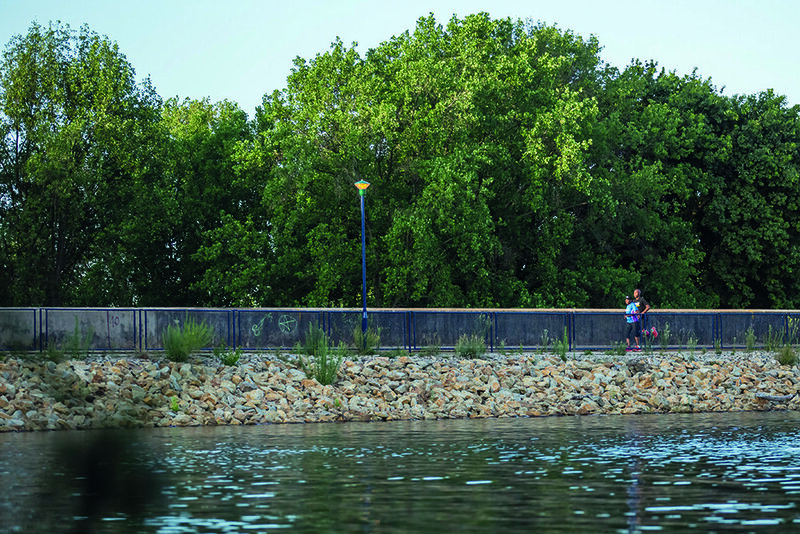 Paved and gravel paths slope gently towards the west side of the Gardens, which surround the dam, and there are singletracks close to Delta Park. None of the trails are technical, except for the ones by the fence surrounding Marks Park. Be aware of cyclists, people with dogs, and children riding scooters and bicycles. If you’re after more variety, incorporate the roads in the nearby suburbs of Greenside, Emmarentia, Melville, Linden, Victory Park and Montgomery Park. Be aware of traffic. Dabulamanzi Canoe Club; SUP yoga; Emmarentia Sailing Club; Kayak polo; open-water swimming; triathlon; mountain biking; hiking in Melville; soccer and cricket clubs at Marks Park. Emmarentia is between two major roads: Beyers Naude and Barry Hertzog (it doesn’t border Barry Herzog directly). It’s around 6km, in a north-westerly direction, from Joburg CBD. Take Beyers Naude Drive from the N1, and head in the direction of Joburg CBD towards Montgomery Park and Melville. Beyers Naude passes the west border of the Gardens, but the dam is on the opposite side. From Joburg, head north on Barry Hertzog, and follow the signs to Emmarentia Dam on the east side. Then, take the left turnoff to get to the dam. From the M1, turn off in a westerly direction, and cut through Rosebank and Greenside. A few road signs are dotted around the surrounding areas. Lourens Geldenhuys, who used to own the land, asked farmers who had returned from the Anglo Boer War to build the dam; and in exchange he offered each of them a share in the surrounding farms. The dam was built from stone mined at the nearby Melville Koppies, and was named after Geldenhuys’ wife. The land Geldenhuys owned was part of a larger farm, Braamfontein. He donated the section west of the dam to the city; and in 1969, a resolution was passed for the development of the Botanical Gardens. Today, the dam’s notable features include the rose garden, the Huguenot memorial, a succulent garden, an environmental educational centre, and the Floreum, which hosts flower shows. The open area on the slope west of the dam has hosted a number of music concerts in the past, such as Joburg Day and the Summer Sunset concerts. Bands such as Bastille, and even artists such as Johnny Clegg, have also performed there.